Sweden comprises about 174,000 miles of dense forest and 100,000 lakes. The fourth largest country in Europe, it can be compared in size to California. Located on the east side of the Scandinavian peninsula in north Europe, Sweden is bordered by Finland, the Gulf of Bothnia, and the Baltic Sea to the East, Kattegat to the southwest, and Norway to the west and northwest. Sweden stretches about 990 miles north to south, and much of its territory is located within the Arctic Circle. Sweden is generally divided into three main regions: Norrland is the mountainous northern zone, Svealand is the hilly, lake-filled region located in central Sweden, and Gotaland is the country's broad southern plateau. Sweden's largest lake is Vanern, which is also the largest lake in western Europe. About 9% of Sweden is covered by lakes, which are used to transport goods throughout Sweden as well as to other parts of Scandinavia. Many of these lakes are linked to the sea via canals; the 370-mile Gota Canal links Gothenburg in the west to Stockholm in the east. Sweden is home to many rivers, including the Pite, the Lule, and the Indal. Most of Sweden's rivers are short, and flow into one of the country's many lakes. However, the rivers are important for hydroelectric power, and they are also used for short-haul transportation. Sweden's seacoast is more than 1,550 miles long; it is bordered by the Kattegat and Skagerrak seas in the west, and the Gulf of Bothnia and Baltic Sea to the east. Islands and reefs are located along the east and southwest coasts. Sweden's largest and most populated islands are Oland and Gotland, located off the eastern coast in the Baltic Sea. The northern area of Sweden boasts the country's highest mountain peaks, including Kebnekaise, which is 6,946 feet high. Sweden has five climate zones, each of which support different flora and fauna. We encourage you to study this map of Sweden in order to learn about the geography of Sweden. Click on the map to display a higher resolution Swedish map, showing Sweden's departments, population centers, roads, and rivers. Map of Denmark - Denmark map and travel information. 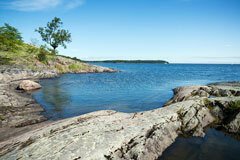 Visit Sweden - official Sweden travel and tourism guide. Swedish Flag - images and history of Sweden's flag.